Lewis Hamilton rounded out the season by winning the Abu Dhabi Grand Prix in his Mercedes. It wasn't a runway victory as a risky early pit strategy put him back in the pack. But he came through to win his 11th race of the year and the 73rd of his career. Here's how it all unfolded. Hamilton started from the pole for the 81st time in his Formula 1 career. Last year's pole and race winner Valtteri Bottas missed the pole this year by 0.163 of a second. So he lined up second in his Mercedes. The next two rows of the grid were team-by-team. Row two contained the Ferraris of Sebastian Vettel and Kimi Raikkonen. And row three had the Red Bulls of Daniel Ricciardo and Max Verstappen. All of the top six drivers started the 55-lap race on Pirelli's ultra soft tires except Verstappen who was on the hyper soft slicks. 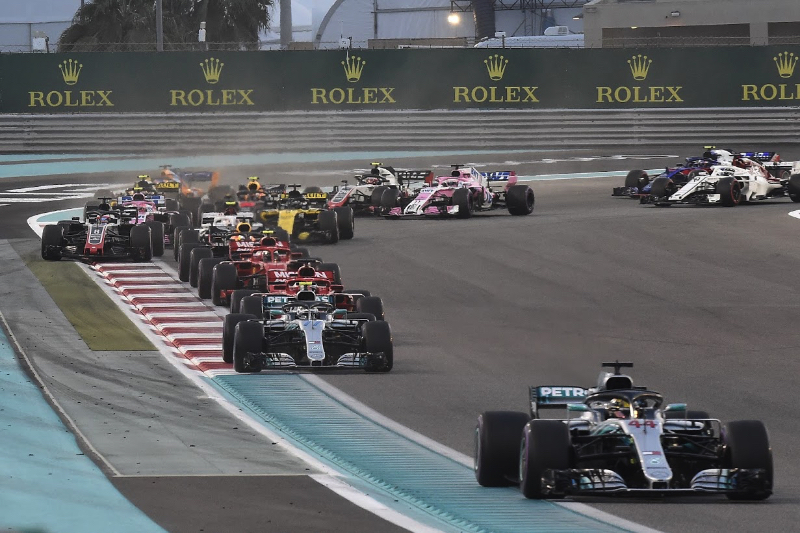 Hamilton made a great getaway to take the lead ahead of Bottas, Vettel, Raikkonen, Charles Leclerc (Sauber) and Ricciardo. Verstappen's engine bogged down and he dropped to ninth. On the opening lap Nico Hulkenberg's Renault was flipped into a barrel roll by Romain Grosjean's Haas and came to rest upside down. "It looks spectacular when cars flip but luckily it wasn't a high impact crash," Hulkenberg said. "It was a racing incident; I didn't see Grosjean – I thought that he went off the track and I took the apex, but the tires touched and I flipped to go upside down." That bought out the Safety Car until the end of lap 4. As he was about to start lap 7, Raikkonen in car #7, coasted to a halt on the pit straight when his engine quit. That's how his final race with Ferrari ended. The Virtual Safety Car was deployed so that the Ferrari could be moved off the track. Hamilton pitted at the end of lap 7 for a set of the super soft Pirellis. Bottas led until he made his stop at the end of lap 16. A few spots of rain appeared around lap 24, but it never got any heavier. Ricciardo's team had decided that he would go long, so he didn't pit when the other front runners did. That put him into the lead from lap 16 until he finally stopped at the end of lap 33. As the pit stops cycled through, Hamilton moved up in the order. He was back out front of the race on lap 33. Ricciardo dropped to fifth. Bottas was not having an easy time out there as Vettel, Verstappen and Ricciardo all eventually overtook him. "This race probably sums up the year pretty well - it started off well but then it went downhill from there," said Bottas who finished fifth. The question now was would Hamilton's tires, which had been on the car since lap 8, last? Or would Vettel, Verstappen and Ricciardo close in? The tires did last and Hamilton slammed in the win. It was Hamilton's 73rd Formula 1 victory. "This year has been a very uplifting experience for me," he said. "I wanted to come here and make sure that I left no stone unturned; the team did an exceptional job all year long, so I really wanted to deliver for them and end the season off strong. I think I was able to do that and I'm really grateful for all the support throughout the entire year." "It's been a tough year," he said. "I tried everything until the last lap, also today, I really enjoyed. Catching a little bit, a little bit, but I think he controlled the pace at the front." Verstappen was third and thus was on the podium for five straight races. "I struggled in the closing laps a bit because I couldn't see," he said. "My visor was covered in oil from the back of Pierre Gasly's car, if I wiped it, it made it worse, it was like driving through fog." Ricciardo was not happy to finish fourth in his final race with Red Bull. "I would have loved to sign-off this chapter with a podium," he said, "so I can't be ecstatic with fourth and there is a little disappointment there. I led for a while which was fun but staying out put me out of touch with the leaders." Fernando Alonso signed off his 312th and final F1 race with an 11th place in the McLaren. "It has been a very intense and good few days," he said. "I think I still need a couple of days to take everything in that I've lived and this weekend will always be in my heart. There have been so many nice things prepared for me from Formula 1, from my team and from the fans. I've been extremely busy, and didn't have the right time for myself to think about what was going on." Hamilton, Vettel and Alonso all spun donuts on the pit straight after the race. And that is how the 21-race 2018 Formula 1 season came to an end.